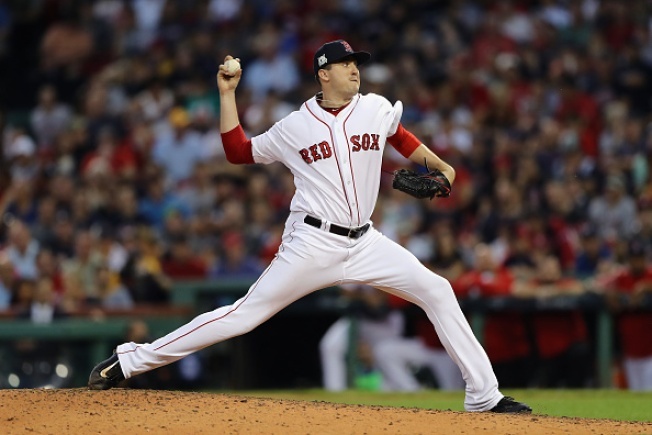 Red Sox pitcher Carson Smith dislocated his pitching shoulder during a tantrum and went on the 10-day disabled list Tuesday, an injury Boston said could be major. "They're going to wait a couple days, let it calm down," Dombrowski said. "I'm sure at some point we'll get a second opinion. But I don't know the severity, but it's not a mild (issue). We're not expecting him back in 10 days, by any means, at this point. We'll see how severe. But it's got the potential to be a major injury." Davis' homer was the only run allowed by Smith in his last six games and 4 2/3 innings. He was 1-1 with a 3.77 ERA in 18 games and 14 1/3 innings this season. "I throw my glove every day playing catch with him. It's part of my warm-up routine,'' Smith said. "I go through my throwing motion, throw my glove. I actually usually hold on to it; sometimes I accidentally release it. I think it's a freak accident. I think fatigue played a factor with my shoulder and my shoulder just couldn't handle it."